The holiday season in a time when ovens everywhere warm up and start producing all manner of sweet goodies. Being the Grandpops of Geekery that we are, it seemed like a great time to take a spin around the net and see what kind of confections are folks are cooking featuring one of our favorite sci-fi settings: Star Wars. 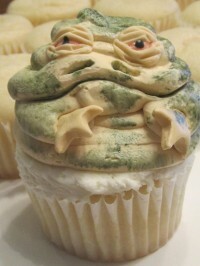 GeekDad points out this pleasantly plump Jabba the Hutt cupcake. So tasty yet so disgusting! Over on Dvice they’ve uncovered a simply breathtaking AT-AT gingerbread construct. Of special note is the gingerbread Luke Skywalker hanging off the bottom. As someone who annually swears through the construction of a Christmas (and often Halloween) gingerbread house, I can’t imagine the architectural miracle holding this thing together! Here’s a much more structurally stable AT-AT when it comes to cake construction. 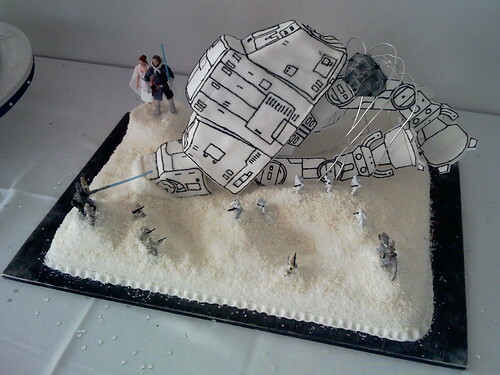 This amazing battle of Hoth cake was spotted on A Wedding Cake Blog. This spectacularly gory yet scrumptious creation from Barefoot Kitchen Witch shows the in-laws coming over for Thanksgiving. Or maybe it’s the Wampa scene from Empire Strikes Back. This page is most definitely worth a click thru as it shows the step-by-step build of this mouth watering munchie with many more pictures. Finally, what we need is a sweet batch of cuteness to cleanse the pallet from all that tasty Tauntaun horror on Hoth. Between the Pages has just what we ordered with this Star Wars R2-D2 cake. Creator Deborah Cubbon has also uploaded a slideshow video showing some close ups of R2 under construction. That is so cool and I am mad now! I WANT ONE! Make it a Jabba.